Pitch is a love letter to the typewriter. A typewriter has a singular purpose: putting letters onto a page. Put the paper in, stab away at the keys and letters instantly appear. It is tactile, analogue, immediate. The German «Schreibmaschine» means ‘typewriter’, and upon closer inspection is literally composed of the words ‘writing machine’. For me this is the perfect definition for a typewriter. 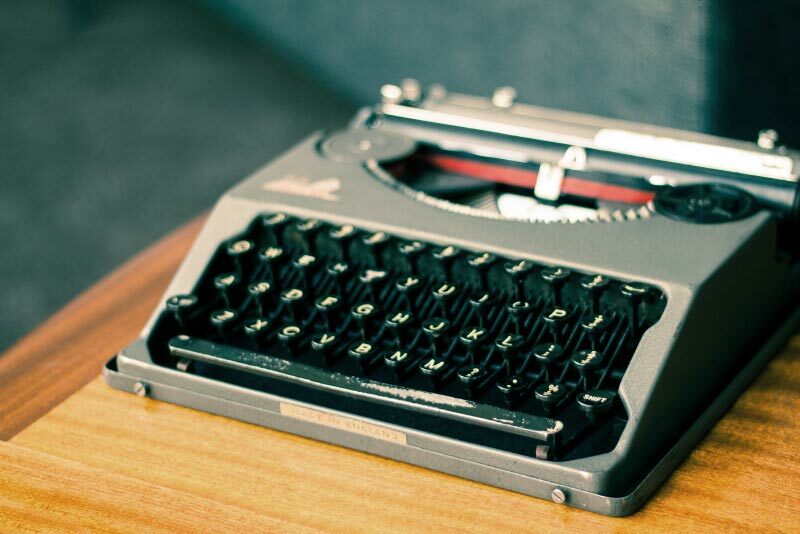 With a legacy of functionality, romance and literary seriousness, writers and journalists used typewriters to great effect. No formatting, no typographic styling: just the writer and their words. It’s a humble, beautiful object, a representation of mechanical refinement and industrial design. It is an honest machine, it does exactly what you tell it. The honest aesthetic of the typewritten text these writing machines produce is wonderful. I wanted to capture this particular aesthetic with Pitch. The aesthetics of typewritten text are largely due to three things: monospacing, type style, and the artefacts of struck paper. Monospacing was initially a mechanical necessity for typewriters. In short, each letter takes up exactly the same amount of horizontal space. The opposite of monospacing is ‘proportional’ spacing, which is what the majority of typefaces have. Having a fixed width allowed the typewriter engineers a predictable unit of measure to advance the strike. When a key is pressed, a letter strikes the paper and the carriage moves along a fixed distance. A fixed width introduces many interesting design challenges. Choosing the width is a paramount concern. If it is too wide the narrow letters (like i j l) start to sprawl and stretch. Too narrow, and wide letters (like W M) are squeezed into ridiculousness. Pitch has almost exactly the same dimensions as Courier. Courier has a good fixed width—it is a ‘10-pitch’ typeface: at 10 point it will fit 10 letters to the inch. With its excellent dimensions and proportions it strikes a fine balance. The cap height is quite small (eliminating the need for smallcaps), it avoids becoming tall and narrow which would create disharmony with the lowercase. The x-height is generous, giving the lowercase necessary breathing room. Courier was designed by Howard ‘Bud’ Kettler in 1955 for IBM. It has since become thoroughly ingrained within the typographic landscape, inspiring and influencing a few notable typefaces. Kettler is a terrific 21st century ode to Courier by Eric Olson. It reminds me of Crouwel’s stamp numerals and ‘Polytene’ typeface for Olivetti, later digitised and expanded into the Gridnik family by David Quay. Peter Biľak from Typotheque used the same 10-pitch set width as Courier for Fedra Mono. Courier Sans is a clever reworking of Courier to circumvent the rules of a student assignment. Its popularity lead to its expansion into a full family and eventual retail release by Lineto. There is no real typographic need for monospaced fonts. Apart from programming and numeric tabulation, almost all typographic tasks can be happily managed with proportional fonts. Despite this, monospaced typefaces maintain a healthy presence in contemporary typography. Initially I disliked the choice of Courier in graphic design. It didn’t seem ‘typographic’, it felt arbitrary and default. It was, of course, just rubbing up against the bounds of my own taste. I have since learned to love Courier. This is due to some of my favourite typographers using it to great effect: Catherine Griffiths for the TypeSHED11 identity, Duncan Forbes for works like Object Lessons and Play On, and the inimitable Hort for the witty Bauhaus Dessau Foundation redesign. Remington & Underwood are stalwarts of the typewriter genre. There are many variations on the theme, but these two typify it for me. I admire the warmth and weirdness of these styles. The clarity of the light weight and the ball terminals create a charming texture. They defy narrow classification, they are almost monoline Clarendons or British Egyptians. Perhaps they were modelled from styles such as Caractéres Maigres and Antiqua-Zierschriften? Perhaps it is simply an unanswerable classification question. Either way, the light weight and robust skeleton adapts superbly to monospacing. What is also important about these styles is the monoline construction: each letter is made from a line of uniform thickness. This is a constant feature for most classic typewriter letterforms, from Remington and Underwood to Courier and Lettera. Even the digital incarnations of Courier maintain a nearly perfect monoline construction. Again, this is quite unusual—most typefaces have stroke modulation and optical correction. Where possible I made the strokes in Pitch monoline, disregarding my natural inclination to optically correct. This is particularly evident in the bolder weights, which correlates to ink-spread the artefacts of struck paper. Typewriters are analogue. A struck letter will never give the exact same impression twice. This is one of the more charming aspects to typewritten text. I tried to emulate this once before by making a crude monospace version of National. I gave it the right ingredients—rough outlines and random alternates—but overcooked it. It is a failed experiment. So, with Pitch, I wanted to avoid all the obvious analogue parallels to typewritten text: irregular strike, soft outlines, fluctuating baselines. Specific analogue emulation wasn’t my goal. Besides, FF Trixie HD does it better than anyone else! To me, Trixie is the final word in distressed digital typewriter typefaces. There is nothing inherently wrong with skeumorphism in type design, it just wasn’t right for Pitch. I didn’t want to limit its application to emulating faux-typewriting. This is why I chose to work from the type-founders versions of typewriter fonts, not the typewritten texts themselves. What did interest me about the struck letter is how it becomes bolder. The harder the key is hit, the more ink it impresses into the paper. The ink spreads around the letterform, pooling in some areas—especially where two strokes join. It’s a linear way to make the letter bolder. (In typeface design, weight is usually added more to vertical strokes that horizontal ones.) I followed the brutish bolding effect by adding weight to Pitch in the same linear fashion where possible. Coupled with the angled brackets, ball terminals and monoline strokes, the overall effect is very analogue, very typewriter-ish. The roots of Pitch are most certainly in Darling. Darling started its life as an uppercase-only caption face for the first Klim type specimen. Like National, I attempted to monospace Darling but it was an absolute disaster. It was too delicate and florid, the proportions were all wrong. 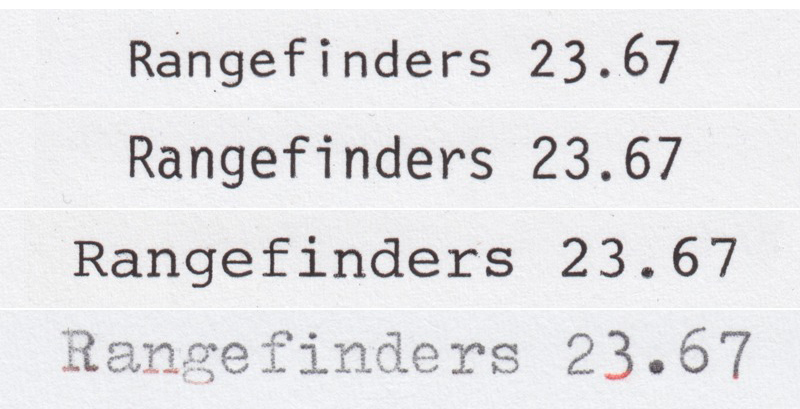 I abandoned it and looked more closely at existing typewriter typefaces. What I needed was something with the raw material of Darling, the pragmatism of Courier and the warmth of Remington. 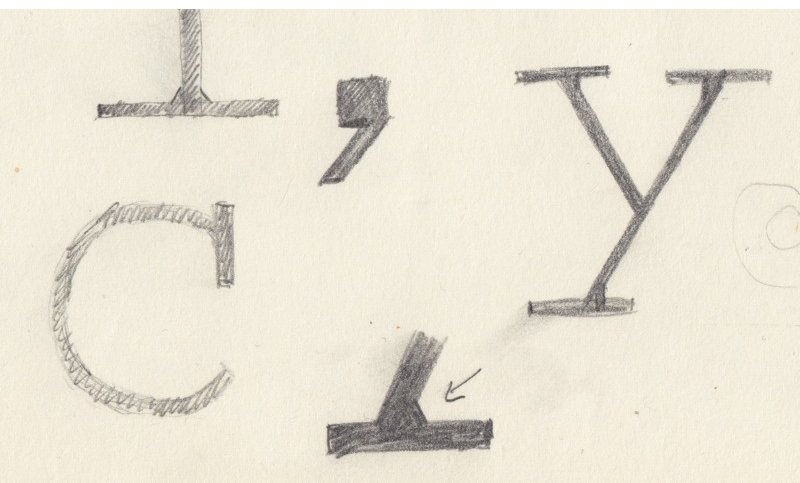 I kept a few things from Darling: the light weight, the practical slabs, the linear skeleton, most of the ball terminals and the flat apexes of M. However, the catalyst was a sketch I made of simple angled terminals. These were the perfect synthesis of digital and analogue that I was searching for. ‘Schreibmaschinenschrift’ from the Bauer’sche Giesserei specimen book. There are few noteworthy historic italic typewriter styles. Luckily, buried deep inside my Bauer’sche Giesserei type specimen is ‘Schreibmaschinenschrift’. This was the starting point for the Pitch italics, particularly the wonderful k.
Not everything in Pitch is sourced from the typewriter genre. As explained earlier, monospacing causes problems with wide characters. Fractions can be troublesome, they usually need a lot of elbow room. Most typewriters employ stacked fractions, or ‘nut fractions’ as they’re known in the trade. Nut fractions are narrow, but they’re also too tall for my taste. The fractions in Pitch are the perfect balance: the split-bar prevents gumming up visually and allows the numerals to be a decent size. This is a old solution: Linotype nailed it almost a century ago with their 5.5pt Excelsior newspaper typeface. Pitch is available in five feature-rich weights in Roman & Italic.